I wanted to know the name of the fallacy or fallacies the Pascal's Wager in the sense that it can be applied to motivate one's belief in many things. A similar argument to the original Wager can be used to say that it is prudent is to believe in the devil (of course not in conjunction with a Christian God), or that black magic works, or really any unlikely belief that might have some potential benefit. When it justifies many cases does it not weaken the argument in case of God? If so what fallacy is this? "Traditionally, a counter-argument in this sense is an argument that shares the same logical structure of another argument, has true or reasonable premises, but an absurd or patently false conclusion. In this way, since we cannot accept the conclusion of the counter-argument, we cannot accept the conclusion of the original argument either: despite its apparent soundness, there must be something wrong with the argument (although this method of refutation does not say what is wrong)." A famous example of this is Gaunilo's counter-argument to Anselm's ontological argument for the existence of God, discussed in the paper. Very briefly, Anselm argues that God can be conceived as perfect, and therefore must also exist in reality, because otherwise he would be imperfect. Gaunilo objected that if that worked then the "perfect island" must also exist (and by extension any other conceivable object with "perfect" attached to it). However, the validity of the reasoning's extension, and the judgement of the "absurdity" of the conclusions can both be questioned. For instance, one could argue that transplanting Pascal's Wager onto the devil does not work because with the devil there is no guarantee of "infinite reward": after all, he is a deceiver. Silvestre discusses diffusing Gaunilo's objection along this route. And sometimes proponents of an argument are committed to it enough to be willing to accept the seemingly "absurd" conclusions of its extensions - this is called biting the bullet. "The main problem with Pascal's wager is that it suffers from the fallacy of bifurcation. It only calculates with two options when there are, in fact, at least four alternatives: the Christian God and afterlife, some other god and afterlife, atheism with afterlife, and atheism without afterlife... Because Pascal's wager fails to tell us which god is likely to be the right one, you have a great probability that you picked the wrong religion and go to some other religion's version of hell. This is referred to as the "avoiding the wrong hell problem"... Believing in the wrong god has one additional problem. Most religions assure you that blasphemers will be more severely punished than un-believers. Once again, if we calculate with the rest of the possible gods, the chance of you being wrong is P=1-1/n so you both run a bigger risk than the atheist of being punished and risk the greater punishment." For more on objections to and defenses of the Wager see IEP and SEP articles. I don't think we can categorize it under a single fallacy. Furthermore...why would we want to? We'd have to explain our reasoning anyway. What we do instead is simply look for the premises of the argument and attack them. There either exists a god C or there don't exist any god. We either believe in a god C or we don't. If there exists a god C and we believe in this god then we benefit infinitely. If there exists a god C and we don't believe in this god then we suffer infinitely. A similar argument to the original Wager can be used to say that it is prudent is to believe in the devil (ofcourse not in conjunction with a Christian God) or that black magic works or really any unlikely belief that might have some potential benefit. When it justifies many cases does it not weaken the argument in case of God? It does. Your argument basically denies (1). We could also just change the conception of a single god for (3) or (4) with a similar idea. Pascal's Wager presupposes ignorance - god can't be proven or disproven through reason . Pascal's Wager excludes proof due to reason. Therefore we've no reason to think that (1) is true, and we can assume any number of possibilities. Hence we can't make a sensible choice anymore. And so on. 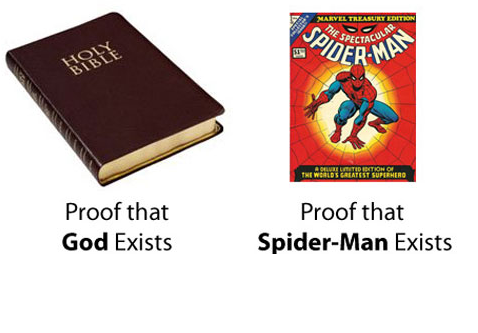 If someone posits that premise (1) just says that, "There exists a god or there doesn't. ", then the firstly leaves us the possibility of adding a premise for other gods and secondly doesn't directly lead to (3) or (4). Now if someone objects that the other conceptions are just impossible then that person tries to include reason. This breaks with the assumption of ignorance. So then we can just argue with other arguments against the conception that the person holds. So this at least makes Pascal's Wager unsucessful, because we need the condition of ignorance. The soundness is dependent on whether we consider only one god C possible, but that is outside the argument. edit: edited for a significant flaw, as I intended for slightly different premises but then wrote other premises. Added explanation when the latter option - the one I used beforehand - of premises is used. If the use value is the reason for believing in God, then surely, one should believe in any ideas insofar as believing in their existence has use value. It could be that Pascal's own argument is fallacious, but the questioner concludes fault in the Pascal's reasoning not by examining Pascal's own argument, but by employing Pascal' method of reasoning to other cases. For this reason, the fallacy actually lies not in Pascal's reasoning, but in the questioner's reasoning, as he misapplies the reasoning method to other cases. The name of the fallacy the questioner commits is called faulty analogy. The fallacy happens when one attributes certain quality to two things that are relevantly different. For instance, the properties we attribute to God is very different from those of Satan. Some dissimilarities between God and Satan might be that God is boundlessly good and forgiving, while Satan is revengeful and tyrannical. The quality of after-life envisioned by the God and by the Satan is also very different. Pascal is especially moved by the calculation of the eternal salvation as against the eternal damnation aspect of the use value. If the questioner wants to protest that Satan and God share all the properties equally, then by the Leibniz's law of identity, the two are the same entity. Insofar as Satan and God are two different entities, Pascal's reason for believing in God cannot be applied to the case for the Satan. Since I do not think Pascal's argument is fallacious, and since I detest a long post, I offer this second post, as an appendix. Pascal 1. Either God exist or does not exist. Pascal 2. Either I should believe in God or should not believe in God. Pascal's decision is based on the Bayesian decision theory which states that the rational course of action is the one that leads to the maximal expected utility. Pascal thus concludes that he should believe in God since believing in God offers infinite utility over not believing in God. I do not see any fallacy in his reasoning. If one rejects Pascal's conclusion, she must be regarding any of the above assumptions as unwarranted. But believing that the assumptions are false does not mean that the reasoning is fallacious. That is, if we accept the paradigm of the Christian God, and if accept all the assumptions (including the Bayesian method), one must accept the conclusion. With this, I respond to the claim that Pascal's argument is fallacious, following Conifold's suggestion, due to committing the fallacy of bifurcation. So the fallacy must lie in either Pascal 1 or Pascal 2. Pascal 1 is a tautology. So the fallacy should be in Pascal 2. Indeed Conifold seems to assert that Pascal 2 is a false dichotomy since there are other possible gods that Pascal neglects to consider to believe in. But considering other possible gods are irrelevant to Pascal's question, which is whether he should or should not believe in this particular God presented to him. The situation is similar to the case whether I should or should not love this woman. If Conifold points out to me that I neglected to consider all other possible women I could love, then surely Conifold is missing the question that I am asking. The existence of other women is irrelevant to my question since my question is whether I should or should not love this particular woman. For this reason, Pascal 2 does not commit the fallacy. Pascal's Wager sounds convincing at first, but if you think clearly about it, the wager quickly reveals itself as deeply flawed logic. 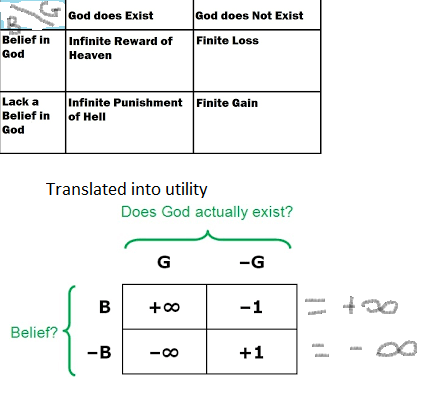 If the Christian god is real, then you either receive eternal reward (+infinity) or eternal punishment (-infinity) based on belief. If the Christian god is not real, then you do not stand to gain or lose much by (not) believing in the Christian god (say, +1/-1). The wager concludes that not believing in the Christian god is too risky for the modest potential gains. There exists a god that punishes only Christians and rewards everyone else. There exists a god that punishes people who believe in him based on probabilities (such as Pascal's Wager). There exists a god who punishes everyone who is not an atheist, and rewards atheists for not believing in him. For Pascal's Wager to really hold up logically, one has to show that the Christian god is more likely than any of the infinite other possibilities. There is no a priori reason to expect that. The reason that Pascal's Wager sounds so convincing at first is that the Christian paradigm was common among Pascal's peers (and still is many places), hence the Christian god seemed plausible whereas other possibilities were not considered equally plausible. Let us weigh the gain and the loss in wagering that God is. Let us estimate these two chances. If you gain, you gain all; if you lose, you lose nothing. Wager, then, without hesitation that He is. (...) There is here an infinity of an infinitely happy life to gain, a chance of gain against a finite number of chances of loss, and what you stake is finite. And so our proposition is of infinite force, when there is the finite to stake in a game where there are equal risks of gain and of loss, and the infinite to gain. The first proposition is that reason cannot decide whether God exists or not. Here there is an assumption that the only deity that possibly exists is the Christian one (whereas there could be an infinite number, or a different deity than the one posited by Christians). This appears to be a quantification fallacy. The second proposition is that it's a game of head or tails – the tossing of a coin rather than a dice, or one of those multifaceted dice used in D&D games. This repeats the quantification fallacy in the first proposition. The next proposition is weighing the infinite gain of the eternity of heaven against a finite loss of a life spent believing in something that may or may not exist. That one looks like an argument from silence, "where the conclusion is based on the absence of evidence, rather than the existence of evidence". I have always thought that there was something obnoxious about Pascal's Wager; perhaps it's the logical flaws, or perhaps it's the fact that any deity worth its salt would reject such cold calculations anyway. Or the fact that the posited deity cares about whether you believe in and worship it or not, rather than whether you try to live a good life. The primary fallacy in Pascal's Wager is that faith is not just a matter of convenience. Simply mouthing the words does not qualify as belief. However there is a secondary fallacy in Pascal's Wager, which your argument exposes. If your method of worship of your deity requires you to commit evil acts, then not only is this immoral, but a benevolent deity would commit you to Hell in spite of these acts being committed in Its name. This is solved by the Atheist's Wager, which directly refutes Pascal's Wager. This also demonstrates the fallacy of morality being derived from religion. Every religion, and every holy text, is created by humans and is therefore fallible. Only by checking whether actions are truly moral from first principles, based on harm caused to others, is it possible to live a good and moral life. Um, seems to me that the problem is of assumptions. The critical assumption is that "belief" alone, will bring benefits (eternal life, not eternal damnation). The "Christianity" that Pascal refers to requires more than belief - it requires the following of rules and therefore a cost which is not accounted for in the wager. (i.e. the following of those rules may bring finite benefits - or deficits, during life.) Usually Christian churches require you to "believe with your heart" not simply say the words because you think it accrues benefits. Replacing that "god" singular with another "god" doesn't change much, unless it happens to be a God who grants benefits if all that a "believer" does is believe. Testing Pascal's Wager by replacing the Christian god with the Christian devil only fails if you believe in the Christian god (and take "his" word for the qualities of the "devil"). Of course, if there is only one god, then all gods are the same god, which is problematic given that they all usually make strict demands before endowing benefits - and especially problematic if they don't provide any benefits. It seems fallacious to say Pascal's Wager can only be applied to a Christian god when the rationale is to determine the greatest benefits (and minimal losses) until you've proven there are no other gods or that they cannot provide benefits to their believers. A poor analogy would be to say that otherwise it's like arguing over how many angels can fit on the head of a pin while assuming that nothing else can/will be also on the head of the pin, and that angels can be packed in tightly. I think the answer is simpler than any given so far. Is it possible there is a Being of which no greater than can be conceived? Nice question but one not too amenable to a finite mind. Is it possible there exists a being of which no baser can be conceived? And I consider an uninteresting philosophical question to be ipso facto a fallacy. Thus any sort of wager on the Infinite by the finite overestimates the finite mind and underestimates what it is to be God. In short, Pascal's Wager is is a cowardly shortcut that only works if one is fool enough to believe a God worthy of being worshiped can be gotten the best of with end run around the requirement of faith. the biblical text spends no time arguing for the existence of God, though it does on occasion lampoon belief in any of the many gods worshiped among other cultures. the biblical text does spend a fair amount of time lamenting God's apparent disinterest in temporal justice. Not the answer you're looking for? Browse other questions tagged logic philosophy-of-religion argumentation pascal or ask your own question. How are we to interpret the logos with God in the beginning?